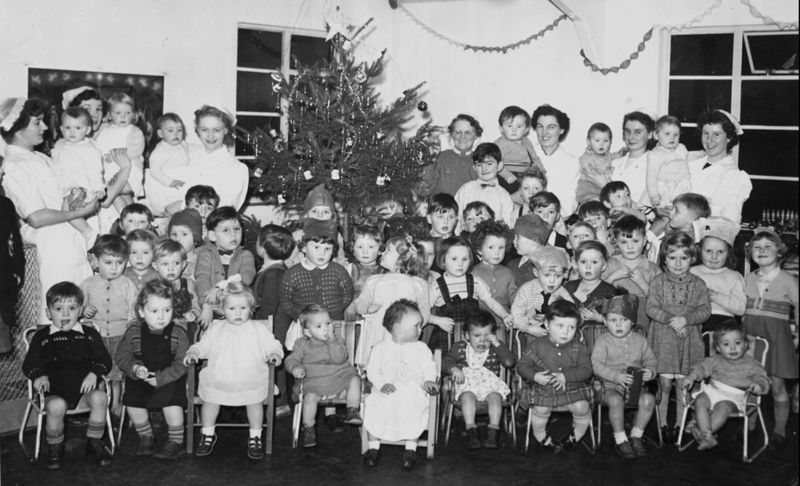 The staff and children of the Nursery School that was on Trevor Road in Beeston, holding a Christmas party in about 1954. The person in charge of the nursery was Miss Burns, who is the second adult to right of tree against the back wall. The photograph was kindly provided by Roger Brailsford who appears on the second row from front, 4th from left, with glasses. Cheryl Bilbie has kindly made contact to identify herself, then Cheryl Lane, on the second row, wearing a pinafore dress, standing behind the little girl who was crying. The Trevor Road building, probably dating from the early 1940s, has had various uses over the years. Now, much modernised, it is occupied as Beeston Family Centre. This is one of several photographs with associated memories shared by Roger Brailsford who, as a child, lived at one of the Fire Service houses at the top of Stoney Street where his father, Bill Brailsford, served as a firemen. Roger now lives in Australia.